BBC NEWS | Have Your Say | What are the challenges facing Africa? What are the challenges facing Africa? UK Prime Minister Tony Blair is chairing the first meeting of the new Commission for Africa. The Commission for Africa will be a year-long assessment of the continent's most pressing needs and how best to tackle them. The main issues will include reducing poverty and conflict, improving education and the economy, tackling HIV/Aids and ending conflicts. Among those involved is Sir Bob Geldof who was one of the driving forces behind the commission and is currently campaigning for Ethiopia. What are the problems that need addressing in Africa? How should those issues be tackled? Do you think the commission will make a difference? Send us your views. Africa's real problem is corruption. There can be no meaningful progress in Africa till Africa begins to have leaders of vision, respect of humanity and love of country. While I welcome Prime Minister Blair initiative, Africa will have to live up to the cause of reasoning that no matter the help, it is for us to change our unproductive attitudes and begin to see the big picture that if the resources are evenly distributed we will be better off. The problems in Africa can be classified as internal and external. Socio-cultural factors are primarily responsible for the former; while the later is mainly linked to double standards in the global political-economy. Africans whether literate or not, should moved away from ethnic rivalry and segmentation, and religious fundamentalism and work towards the good of the continent in entirety. The Western powers should ensure that a level economic playing field exists which will significantly contribute to reducing the gap between the Developed and Developing regions. Until these issues are addressed seriously, Africa's problems may appear insurmountable. The Commission for Africa may set the pace; but much more needs to be done. Africa only needs a fair chance on the market, for example agriculture. The European farmers get millions of aid which makes competition very hard for the African agriculturists. Instead of being given fish, they need to learn fishing. Give Africa access to EU agricultural and other protected markets by scrapping the Common Agricultural Policy. Give them complete freedom from intellectual property rights laws for products sold within their own borders (for a limited period). Cancel Africa's debts. Allow economic migrants from African countries. Stop arms sales. If we do that then Africa will recover within 25 years. Sub-Saharan Africa is incapable of eradicating disease, famine, drought, war and corruption without outside help. The problem is with the corrupt ruling elites who are only interested in plundering the wealth of their countries and living like kings. Unfortunately the spectre of colonialism prevents any direct action by Western European countries. Tony Blair has to prove that his involvement is not just another PR exercise to restore his battered reputation. Let's not send food, but education to grow food and keep farms producing food. Africa's many issues can only be overcome with education. Without education, people will continue to starve and die of Aids and racial wars. As an African descendant with an acute interest in the development and prosperity of our forefathers' home, the world seems to be blind to the true reality of the basic nature of Africans at home and in the diaspora. Our current dilemma was deliberately and systematically imposed upon us, as a people, over the past few centuries. To begin, let me unequivocally state that any system of government that is not spiritually based will never succeed in creating the mindset that Africans need in order to foster prosperity. All other alternatives will only corrupt us. Secondly, the solution for Africans lie deeply imbedded within our psyche and will remain there until the burden of our adopted Western mentality has been lifted from off of our shoulders by our own innate spiritual development. Which I may add does surface from time to time in the abbreviated lives of exemplary Africans. More cannot be said at this point, because the rulers of this world are not willing to allow us to arise and develop in our own innovative way. Love and Blessings. I believe the continent's needs are already known. A commission to assess the needs will come back to tell us what we know already. To me the solutions are in the Cancuns, Dohas, Singapores etc. What do we know? Please let's know for what Sir Bob Geldof is currently campaigning for Ethiopia. I hope it's not about the Eritrea-Ethiopia border conflict. I would be highly disappointed if it were. Better late than never! It will be a good thing if action to improve living standards for the poorest people is the result. It would be a shame if it's just another talking shop. Whatever action is taken, it must be by African people for African people, and include the human effect, i.e thought about how people will react and respond to it. Prime Minister Tony Blair may have a good intentions to help Africa in its transformation process. However, there is the need for the British taxpayers not to spend their money in areas where the government practices tribalism and nepotism. Please,do a thorough research in every country in Africa and try to identify the ignominious policies that stifle economic and political growth through tribalism and favouritism. For how long will the few eat everything at the expense of the poor. The question should be rearranged to "What are the challenges facing the world regarding helping Africa?" The problem of Africa is neo-colonialism and Western conspiracy. Without abolishing these two menaces from mother Africa, nothing will change. I think we cannot start talking about education, development and even food, while we are still killing each other. What future do we really have when our children are given guns to fight for causes they have no knowledge of? 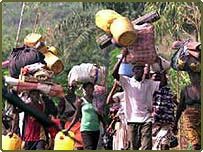 We cannot give Africans a better life when millions of them are displaced as a result of senseless wars and conflicts all over the place. Where do these weapons we use to kill ourselves come from? I wonder who really make profit out these situations. For Africa to move forward we need the international community to be more compassionate about the afflictions of Africa. The International Community should do much more for Africa, which by the way is the bedrock of their wealth and source of their riches. A lot has been said about Africa - the good and the bad, but is Africa capable of sustaining itself? Yes, if the bigger nations stop the systematic 'bullying'. Why can't we be left to make our own rules, instead of the colonial styles used by the IMF, World Bank and their allies. There is an agenda to suppress Africa, supplying arms to rebels by the West, so that they can 'steal' our resources. Pelaelo, Botswana , living in Leeds. The only way a sustainable solution can be found for Africa, that is in the interest of Africans is if it is designed and implemented by Africans. As an African, I appreciate international efforts at helping our continent claw its way out of the doldrums of poverty, but instead of foreigners prescribing a solution only because they wield economic power does/will not work a history has proven time and time again. Ask us what we want/need and discuss with us how we plan to achieve our goals. Sit down with us and rationalize our perspective on issues facing us and please do not offer us aid, which most often turns out to be a Trojan horse of sorts. The continent has an abundance of resources-natural, human etc - the best thing anybody can do for us is to guide and support us, not give us crumbs off their table, which only encourages us to sit up and beg, instead of taking our place at the table. Education, education, education - at all levels, combined with a much stricter enforcement of laws. "Africa has one problem, poverty. All the rest are just derivatives of that." That is most understatement of the year. Look at the natural resources of Africa. I think for African to improve, the world should stop viewing Africa as one country, furthermore African is comprised of many different nations just because we are African it does not mean we all have the same history and philosophy in life. Africa is more diverse than Europe it self. Therefore the issues of keeping colonial boundaries and the issues of self determination as basic Human right must be resolved. I thank Tony Blair for even recognizing the many problems of Africa but hope it won't be a lip service. Setting up agenda and giving aid and funds as we know goes to few people in government and not much is achieved. If he can repatriate all the Government funds stolen/looted from Africa and stored in UK and the rest of Europe that will show genuine efforts to tackle this problems. He can also stop mineral exploitation (not exploration)in Africa. Bob Gerdolf I can't thank you enough you are my role model. Africans have to determine their own destiny. The relationship that exist between Africa and the West is one that does not benefit Africans. We had slavery, colonialism and now neo-colonialism. If there is anything that can be done to deal with the African problems, it is to sever relations with the so called "friends" who only have interests and nothing more. Africa has enough to depend on herself but she has to speak in one voice on African terms and not on Western platforms. Each country in Africa has its own problems. So it will be very difficult to give the whole of Africa the same pill. Now who will lead the commission, the same class who created this mess? Will the true voice of the poor be heard in higher places or will it be just another token hearing like (We Are the World ) for a day? I can not thank Mr Blair enough for this initiative to help the continent called African with this issue of a new commission for Africa. Let them send a commission of experts to go down to Africa, meet the peasants, opposition party leaders, the clergy and some governments. Live expectancy in Africa is very short. Why? The hard working people are frustrated with the bad governments who go to them only during election campaigns. Let the world enable Africa. Corruption - pump more 'aid' money in and all you will get are the select few siphoning more off and governments spending more on arms. This commission won't be of any help. Africans need to sit down and figure out how to solve their own problems. The African Union needs to get their act together. For goodness sake, look at the European Union - they're doing wonders. They're moving in a direction where they don't have to depend on the US for anything. Africa needs to move in a similar direction, where they don't have to depend on handouts. J. Mensah., Michigan, USA. (Ghana). Why has Tony Blair launched this? Africa will never get out of the mess it is in until it learns to walk by itself. For decades we've been providing them with aid but still they are in a mess. The UK has its problems too. We should be concentrating on these problems and let Africa sort itself out. As an African, let me use the opportunity here to thank Sir Bob Geldof for his past efforts for Africa. But I almost believe this commission may turn out to be another pseudo solution to Africa problems. You asked me, how should Africa problems be tackled? then I'll say, the international community should stop to place Africa problems as the last on the agenda. Simple. Take Sudan now for example. Its looking like somebody will wake up in few years to say we could have done more. Africa has one problem, poverty. All the rest are just derivatives of that. While I'd like to think this could be beneficial for African people, I can't help but be cynical due to the fact that Western attempts to intervene in poor countries' infrastructure in the past has merely resulted in allowing multi-nationals to privately run projects. This has ultimately served the interests of the corporate world, while the people become worse off. I don't think a commission for Africa will help. I think there will always be problems in any country, and the African countries should not always depend on the west for help, they should attempt to solve their own problems and put policies in place to solve future problems. It seems the leaders' greediness and corruption always stand in the way of bettering their countries and they need to guided in doing the right thing rather than spoon-fed by the west!